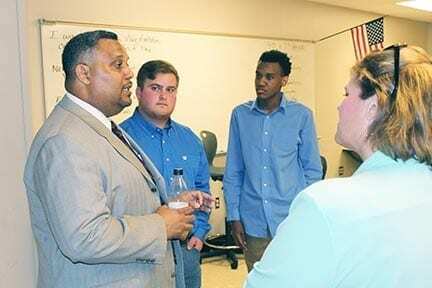 COLUMBIA, TN — Dr. Martin Luther King Jr.’s assassination is “misdiagnosed and miscommunicated,” nearly 40 people were told before criminal justice students reported conclusions from their research. Conclusions include: The KKK, John Birch Society, mafia, and federal agencies are implicated in the murder; James Earl Ray didn’t act alone; King was killed by an expert; and Ray lacked the skills to commit the crime. The conclusions are from Garland Brown’s students at Columbia Central High School. “James Earl Ray was a knucklehead,” Brown said Friday last week. Well before the assassination, “He robbed a grocery, went out the back and into a police station” behind the store, Brown told parents, other adults and students. Some students seemed interested in doing more as they’re considering careers in criminal justice. If it seems unlikely teenagers could do anything with their conclusions, think again. On a request from Hightstown High School students in New Jersey, Sen. Doug Jones, D-Ala., sponsored the Civil Rights Cold Case Records Collection Act, courthousenews.com reports. President Trump signed it into law nearly two months ago. The law requires federal agencies to give the National Archives unchanged copies of civil rights cold-case records within two years, and for archivists to compile them for public viewing. However, the law isn’t funded and Trump can restrict release of records. Brown cooperates with Stuart Wexler, the Hightstown teacher whose students started in 2015 to get those cold case records opened and, Brown says, files made public in 2017 on President Kennedy’s assassination contain records related to King’s murder. The criminal justice teacher is interested in King’s assassination for several reasons. One is that King and civil rights attorney Z. Alexander Looby bailed Brown’s uncle out of the Davidson County Jail in 1960 after a lunch counter sit-in demonstration in Nashville. Looby represented 23 African Americans charged in Columbia’s 1946 race riot. Rebecca James attended with her son, Linton. She said she “always heard they claimed [Ray] did it.” Now, she has reason to believe Ray didn’t do it.